For a number of years before purchasing our ‘wonderful, light filled unit’, Dave and I lived in a very small one bedroom unit with an even smaller shared ‘concrete’ garden. Our unit neighbours and ourselves had a few pots for interest but the area was so hot in summer that it required constant watering and tending to. Often it was neglected (mostly by me) because I didn’t enjoy going out there and I found it really unpleasant. The other thing I didn’t like was that it gave us no opportunity to have a compost. I asked for a worm farm for my birthday one year (I thought it was a great gift, Dave on the other hand thought it less than suitable – thank goodness) but the poor little worms would have cooked before they had a chance to even meet each other. I thought about a tumbler compost but we didn’t have the room or the amount of food and garden waste required for successful composting. So after my worm farm idea was rejected… we just ignored this ‘want’ and decided we would deffinitely have one when we moved (crossing fingers we found a unit with a suitable garden). However, in a fabulous little shop in Bellingen NSW a few years ago we discovered the Bokashi Bucket and have been composting ever since, yes, even in our little unit. So, what is a Bokashi Bucket? Bokashi is a Japanese term meaning “fermented organic matter”. It is a bucket sized composting system designed to break down kitchen waste with the help of micro-organisisms. It produces nutrient rich juice and compost as good as any. No bad smells are produced from composting this way so the bucket can be kept in the kitchen under the sink. It is convenient, compact and user friendly. This is our Bokashi Bucket. We keep ours in our garden – because we have room now. Ideally you would have it elevated so that you can easily drain the juice from the tap. How does the Bokashi Bucket work? The bucket is divided into two sections, a top and a bottom. The top is where the kitchen waste is collected and the bottom is where all the juicy goodness is drained to. Along with the bucket you need the mix. The mix can vary but the one that we currently use is made from ‘crushed Australian grain fermented’ with ‘beneficial microbes and molasses’. These beneficial microbes, when in contact with your kitchen waste get to work breaking it down. They work in an anaerobic environment (no oxygen) which means the bucket wont produce heat or smells and there will be no visits from insects or rodents. As you accumulate your kitchen waste you place it in the top section of the bucket followed by a sprinkling of the Bokashi mix, continue the process until the bin is full. 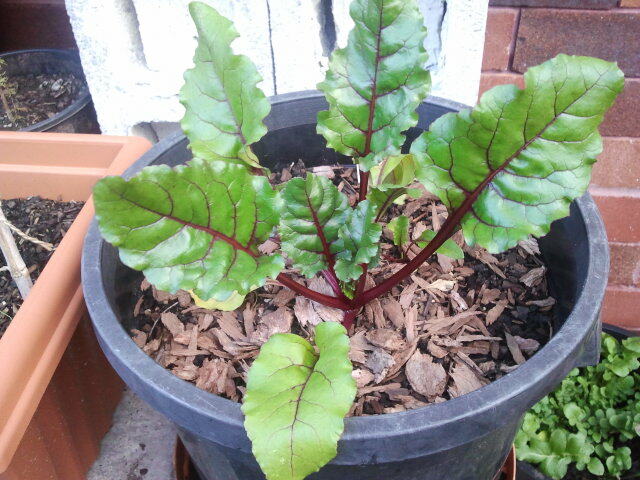 This beetroot has been fed with Bokashi juice. It helps encourage strong healthy growth. What then? During the process of filling up the bucket you can drain the juice from the tap at the bottom of the bucket (so handy) and use it on your garden, just mix it with water and watch as your garden flourishes with new, healthy growth. When the bucket is full you empty the contents, just dig a hole, pour in the Bokashi kitchen waste, mix with a little soil and cover. It is at this stage, when the beneficial microbes and the kitchen waste come into contact with the soil that the real work starts and the waste breaks down into compost. Soon you will have a wonderful compost to add to your garden and the process starts all over again. 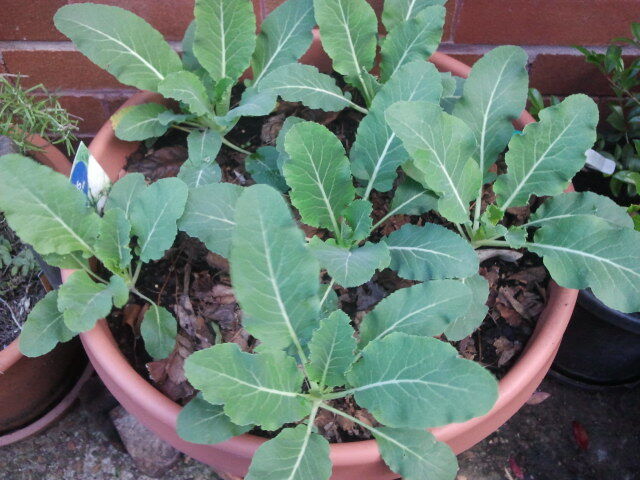 This cauliflower was planted only a few weeks ago and is also fed with a mixture of Bokashi juice and water. Yum, can’t wait for these gorgeous veggies covered in white sauce. What can you add to the Bokashi Bucket? Anything…. We all know that you shouldn’t add meats to your compost or dairy to your worm farm but the Bokashi Bucket has no restrictions, it will compost almost any organic matter, meat, dairy, seafood, bones, hair, the list goes on. So get started…. Unbeknownst to our neighbour, he planted this chilli on top of Bokashi compost. 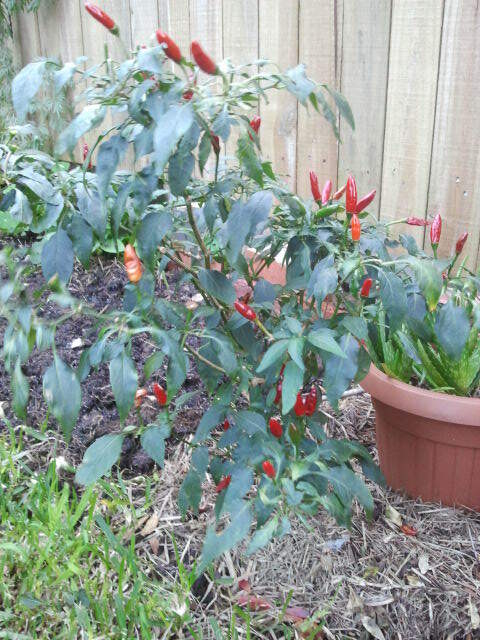 The plant is healthy, pest free and covered in chillis. I would recommend the Bokashi Bucket to anyone. It’s convenient, compact and user friendly. Even if you think you wont have anywhere to bury the compost, be creative, there is an endless amount of possibilities beyond your front and/or back door. 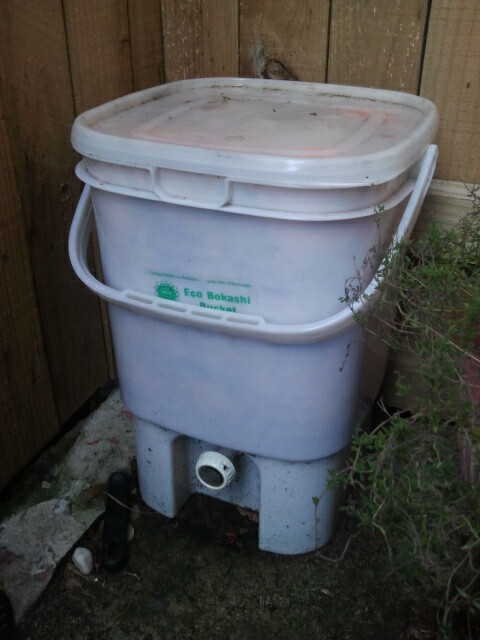 And if you do have space it is still a wonderful addition to a composting system as you can add the Bokashi compost to regular composts and watch it break down even quicker. You can purchase Bokashi Buckets and Bokashi mix from Eco stores, some health food stores or online. So, on that note, happy composting. This morning I ventured out to the garden to check on the progress of the vegetable garden. It is doing very well, everything is thriving and appears to be happy. I know it could do with a little more sun but it’s just not possible at the moment. Over the next few weeks the sun will sink further to the north, but then it will be on its way back. Oh how I look forward to that. But, the vegetables are not what I am ‘so excited’ about. I am ‘so excited’ about my bulbs, well one in particular. 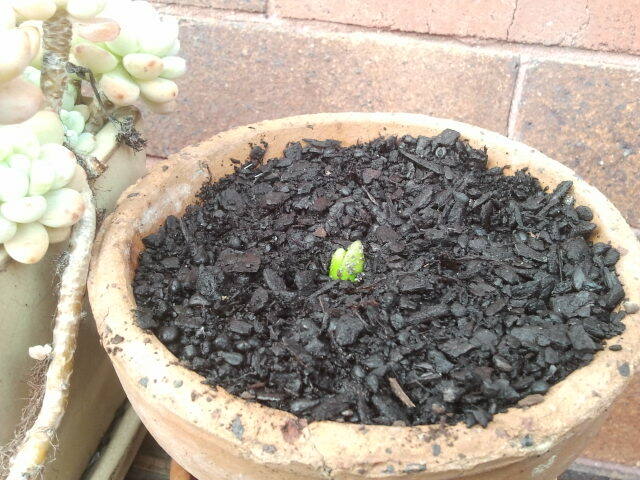 This morning I discovered that one of my Hyacinth bulbs has pushed its way up and out toward the heavens. It is so lovely… look! This pot contains a single Hyacinth bulb, the pot is not very deep and it gets more sun than the other pots that contain either Hyacinth or Tulip bulbs. 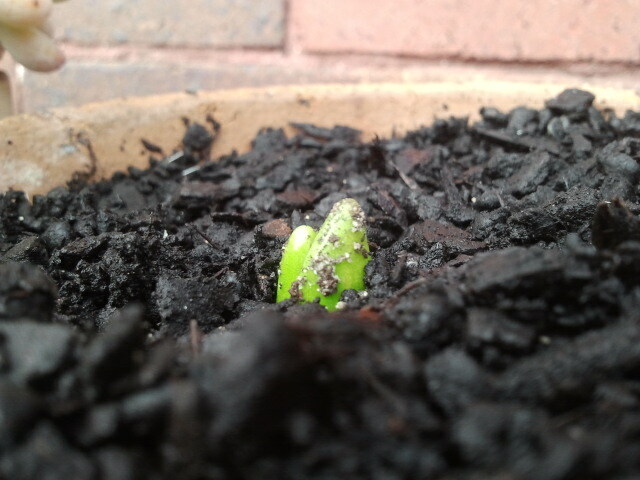 In my opinion the exposure to sun and warmth has enabled this little bulb to have a fabulous head start on the others. Unfortunately I can’t get the other pots any higher, it just isn’t possible. I’ll just have to be patient with the others. I’m sure they will surprise me one morning when I venture out to visit the garden. The next surprise this little bulb will have for me is the colour. I have no idea what colour flowers it will produce, white, blue or pink but I know they will be spectacular and they will smell magical. If you haven’t read about my ventures in planting the bulbs please click here, ‘It’s Bulb Planting Time’. Then you can read about planting Tulip Bulbs, which I did after the bulbs had spent some time in the freezer. Who else is having success with bulbs? I’d love to hear about it.